A second carnival of music and entertainment such as might have greeted visitors to London's Vauxhall Pleasure Gardens in the 1740s. Vauxhall Gardens, on the south bank of the River Thames just upstream from Lambeth Palace, was the pre-eminent pleasure garden of Georgian England. It was the largest, the most commercially successful, and the most influential of all the sixty or more such places in London. ‘Pleasure gardens’ were private commercial resorts where visitors could expect, for a small admission charge, to be entertained with music, refreshments, and a pleasurable rural atmosphere; most had little or no horticultural interest. Vauxhall attracted some 100,000 visits each Summer season, and it thrived as a business for nearly two centuries, from 1661 until 1859. The gardens became internationally famous, spawning many imitators not only in London and the British Isles, but throughout the World, from Charleston in the USA to Dunedin in New Zealand. Vauxhall Gardens featured in the drama and fiction of its time, ensuring its literary immortality, and it is still used by romantic novelists today, as it was in the eighteenth century, as a shorthand for sexual adventure and intrigue. Vauxhall, though, was never a simple pleasure park. It began under the Stuarts as a common tavern garden, but with the Georgians it was turned into a real force for good in the transformation and modernisation of London, helping to make it the most elegant and polite capital city in Europe. Part of the reason for this cultural impact was the artistic patronage of its remarkable proprietor, Jonathan Tyers (1702-1767), who played such an important role in the development of English art and music in the eighteenth century. Under his management, Vauxhall became a hotbed of artistic creativity right at the centre of the cultural and social life of London, where a success would advance a career, and a failure hardly mattered. William Hogarth helped Tyers to turn it into the first great public gallery for contemporary British art, and George Frideric Handel found there the ideal outlet for his secular music, in particular his grand ceremonial pieces, performed there to an entirely new audience, amongst whom his fame would quickly spread. For a long time, we have been authoritatively persuaded that the music performed at Vauxhall Gardens in the eighteenth century is hardly worth our notice—mere background noise to the main entertainments of the gardens. In an unfortunately memorable phrase, Dr Johnson tells us that the music there was ‘not too refined for the general ear’, and for a long time, the phrase ‘pleasure garden music’ has evoked the eighteenth century equivalent of ‘easy listening’. To those who have been misled by Dr Johnson and others, this record and Handel at Vauxhall, Vol.1 will come as a revelation, maybe even a shock. Vauxhall’s music was the best and most original that England had to offer, not just as regards composition, but also in terms of its performance, executed by some of the outstanding musicians of the time. Much of it was written specifically for performance at the pleasure gardens, and almost all of it was very new; some, indeed, would certainly have been too sophisticated ‘for the general ear’, while some of the rest would have had a broad appeal. Despite the rival attractions of the artworks, the food, the displays, and the company, it was always music that was the centre of attention at Vauxhall Gardens, at least from the mid-1730s until the second decade of the nineteenth century, when other more spectacular attractions began to monopolise public wonder. Jonathan Tyers, the developer and sole proprietor of Vauxhall Gardens from 1729 until his death, consistently invested heavily in music, not only in the fees and salaries of performers and composers, but also in the design and erection of high quality specialist permanent buildings; these were some of the first such buildings in Europe, intended to present the performers to the greatest advantage for their new audience, many of whom would never have been exposed to music of this quality before. There was a concert, in the course of which, a hautbois concerto was so charmingly played, that I could have thought myself upon enchanted ground, had I had spirits more gentle to associate with. The Hautboy in the open air is heavenly. Vauxhall was an outdoor entertainment, which came into its own after dark under artificial lighting. This novel convivial diversion wasopen every day from May to September, usually from five or six o’clock in the evening until the early hours of the morning. For the charge of just one shilling, the equivalent cost of admission to a major art exhibition today, Tyers’s visitors, drawn from a huge cross-section of the public, could, for the first time, freely enjoy top quality music alongside original contemporary architecture decorated with some of the best available contemporary visual art. If they wanted, they could also purchase some very expensive refreshments, but this was entirely voluntary, even though it was the sale of food and drink that produced the bulk of Tyers’s profits. We know from Samuel Pepys and others that seventeenth century Vauxhall, then known as the New Spring Gardens, had been little more than a popular country ale-house and place of assignation, approached by boat across the River Thames. It had a large garden of avenues, flower beds and private arbours. The refreshments were basic and often supplemented by visitors’ own provisions. The entertainments, such as they were, were generated by strolling performers or by the visitors themselves. This was not yet a classic pleasure garden, but the great appeal of the place was that the sexes could meet freely there, without the constraints that circumscribed the tricky process of socialising among young men and women in polite society; dozens of the visitors on any one evening would certainly be working girls from the streets of London, looking out for new clients. Pepys himself, though married at the time, would regularly take lady-friends to the gardens for some amorous dalliance after dark. When Jonathan Tyers took over the New Spring Gardens, Vauxhall, in 1729, he could see that it was ripe for a complete transformation; he had ambitious ideas for the place, and a mission to impose apparent moral order and civility on this suburban tavern. As part of his plan to re-brand and civilise the site, Jonathan Tyers dropped the old name in favour of the simpler ‘Vauxhall Gardens’, by which it soon became internationally known. Having great vision and being inspired by many things including the concept of John Milton’s L’Allegro and Il Penseroso, Tyers went on to commission architects, painters and sculptors to decorate and furnish the gardens, and he employed professional musicians to entertain his guests. Among the works of art was the remarkable series of fifty or more modern genre paintings designed by Francis Hayman, a close colleague of William Hogarth, to decorate the supper-boxes which surrounded the Grove, the central gathering place of the gardens, and the remarkable life-sized marble statue of Handel, the presiding musical genius of Tyers’s Vauxhall, designed and created by Louis François Roubiliac. To Tyers, though, the art and music at Vauxhall were never just decoration or entertainment—as far as he was concerned all the arts were morally redemptive, the civilising influence in a chaotic world, so his investment in the arts was as much idealistic as commercial. Tyers re-launched his garden with a grand reopening, called a Ridotto al Fresco, on 7 June 1732, for which the steep admission charge of one guinea was demanded, so as to keep the ‘company’ as select and fashionable as possible. Following this much publicised re-launch, which was attended by Frederick Louis, the young Prince of Wales (Vauxhall’s ground-landlord) and his retinue, and many other distinguished guests including Handel, Vauxhall became London’s most fashionable evening promenade, due in large part to the attraction of royal patronage and royal ownership, much exploited by Tyers. Music played a vital role in Tyers’s Vauxhall. It was the element that set the tone of the gardens; it not only provided visitors with a rich topic of polite conversation and discussion, but it also encouraged people to relax and enjoy themselves, and to behave in an orderly manner during their visit. Tyers’s early concerts were never advertised in the press except in the most general terms, and are poorly documented, but it is clear from the reports that do exist that he consistently favoured British composers and performers. Thomas Augustine Arne, who lived next door to the gardens, became the in-house composer in the 1740s, and it was his music, with that of Handel himself, that dominated the programme. An evening’s concert at Vauxhall began with an organ concerto or minuet, followed after an interval by martial music, rich in brass and, after a second interval, dance music and wind concertos. After 1745, however, the concert was given greater popular appeal by the addition of songs, which alternated with the instrumental pieces. It was at this point that the regular balanced programme took on its standard form of sixteen pieces in two acts every evening, eight instrumental and eight vocal. After 1737, when the grand organ was installed behind the orchestra, one of the instrumental pieces had to be an organ concerto, often composed by the in-house organist (Thomas Gladwin from 1737 until 1744, and James Worgan until 1750), and all the singers would join in a spirited ensemble piece for the finale. The new organ meant that the band at Vauxhall could be relatively small, probably no more than twelve men on any one evening. Employed for the summer months at Vauxhall, these men also played in the London theatres during the winter, when the pleasure gardens were closed. It is clear that these musicians were generally versatile, and well able to play two or three different instruments each, allowing for a huge variety of music to be played. James Worgan, for example, played organ, violoncello, and double bass, and John Hebden ‘cello and bassoon. Others were more specialised, like Valentine Snow, the distinguished trumpet-player and leading light of the important brass section. There is little doubt that the quality of the musical performance was, in fact, second to none. The fashion was for visitors to promenade and chat during the instrumental music, and to return to the orchestra for the performance of songs. As a result of their starring role at Vauxhall, many of the singers became celebrities in their own right. Songs, whether pastoral ballads, love songs, patriotic airs, songs based on themes of hunting, soldiering or spurious regional dialect, became a regular and popular part of the entertainment. With lyrics in English, by contemporary poets like John Lockman, Christopher Smart, or Thomas Tyers (Jonathan’s eldest son), set to music from Handel’s operas, or from the compositions of Thomas Arne, English singers could perform understandable and accessible words set to excellent modern melodies. Handel is closely identified with the early development of Tyers’s gardens, where his music was so often played, and where his likeness dominated the Grove for eight decades. Roubiliac’s life-sized marble portrait presented a strikingly original image, showing the composer completely relaxed, at work on his own. He is portrayed ‘in undress’, sitting down in his house-coat and slippers, resting his left elbow on a pile of his own music books. The composer is shown hard at work plucking Apollo’s lyre, while a putto at his feet writes the notes on a sheet of paper resting on the back of a viol; other instruments and books surround the figure of Handel. This is a bold and innovative composition for a public sculpture. Even its material was contentious—normally reserved for noble statues of royalty, or of dead military heroes in Roman costume, precious white Carrara marble is here used for the informal portrait of an ordinary living person, just a musician. In fact, however, it is not just a portrait; in its elegant informality it is a visual manifesto for the English rococo movement, and it is also an allegory representing the virtues of hard work, and of humility—Handel does not care how people see him, even in such a public space as Vauxhall. He is presented as an engaging, approachable man in his early fifties, rather than the impersonal, elevated composer of incomprehensible Italian operas; he had also become a constant presence in a place where his likeness would be seen and remarked upon by thousands of people every season. As far as Tyers was concerned, he gained, in this statue, a useful talking point, both inside and outside the gardens, and an image that was to become a recognisable personification of his gardens. More importantly, this work gave Tyers a solid artistic credibility as an established patron, especially amongst leading artists and musicians. What the relationship between Tyers and Handel actually was is not clearly understood. Tyers loved Handel’s music and was a constant supporter of his work, and Handel certainly saw in Vauxhall a useful business opportunity, to be encouraged and supported. Whether it went further than this is yet to be discovered, although it seems likely that a real friendship did exist. A fascinating footnote to this relationship appears in the nineteenth century in-house periodical, the Vauxhall Observer of 1823: ‘we are informed the first piece of music Handel had belonging to himself, was one of his own making, which he presented to the then Proprietor of the Gardens [Jonathan Tyers], and which is now in the possession of the present Proprietors [Thomas Bish and Frederick Gye]; it is rough in its composition, yet, as an early specimen of that great man’s skill, must always be considered a most valuable relic by the admirers of his unrivalled talents.’ This most unusual gift (now lost) would suggest the likelihood of a tie of friendship between the two men, that would lead the composer to give the younger man something so personal as one of his own early manuscripts. The continual playing of Handel’s music at Vauxhall really is an extraordinary feature of the three or four decades of Jonathan Tyers’s management. There was a huge musical repertoire available, and musicians were used to a wide variety of work, so it must imply a positive choice by Tyers. His commission of the Handel statue appears to confirm that the choice was his, as does his support of the composer through the purchase of fifty tickets for Handel’s benefit concert on 28 March 1738 at the King’s Theatre, Haymarket—a very generous gesture on his part, both to the composer and to the recipients of those tickets, possibly Tyers’s favoured employees. There is built in the Grove of the Spring- Gardens at Vaux-hall, an Octagon Temple, intended to serve as an Orchestra, for a Band of our finest Instrumental Performers; who will play (beginning at Five every Evening during the Summer-Season) the Compositions of Mr. Handel, and other celebrated Masters. The few compositions specifically reported in the media as being performed at Vauxhall in the 1730s and -40s are all Handel’s: the ‘Dead March’ from his new oratorio Saul (first performed 16 January 1739 at the King’s Theatre), his setting of ‘God Save the King’ from the Coronation Anthem Zadok the Priest, and ‘Hush ye Pretty Warbling Choir’ from Acis and Galatea. The first and last of these were included in the programme of 7 May, 1739, a widely reported occasion on which the Prince of Wales visited the Gardens. Handel’s ‘God save the King’ was performed regularly at Vauxhall; there is a mention of it being performed there during an impressive thunderstorm on 7 September 1745. The ‘Dead March’ from Saul, scored for a typical Vauxhall ensemble of trombones, timpani, flutes, strings and organ, appears regularly in press reports from 1739 onwards, demonstrating that it became something of a recognisable archetype of Vauxhall music. The music performed at the gardens was not so different from that performed (by the same musicians) at the theatres and in the concert halls of London, but with a strong British bias. It was this relatively sophisticated but attractive repertory that was favoured by Tyers’s visitors, who, even though they did not know exactly what they were going to hear on a particular evening, would go along anyway in the knowledge that, whatever the musical programme was to be, it would be of sufficient quality and range for them to enjoy at least parts of it, or to feel flattered by the assumption that they, as what Tyers always called ‘persons of quality,’ were sophisticated enough to appreciate it. Apart from Handel’s Hornpipe Compos’d for the Concert at Vauxhall of 1740, it is hard to say whether any new works received their first performance at Vauxhall, but there is no reason why not—Vauxhall’s appetite for new British music was so huge that the operas and incidental music at the theatres may have been insufficient to satisfy it. Composers like John Frederick Lampe, William Boyce, John Stanley, the anglicised Germans J C Smith and M C Festing, not to mention the ‘in house’ composers such as Dr Arne, Thomas Gladwin and the Worgan brothers, must all have derived considerable income from Tyers’s concert programmes. At all times, the music at Vauxhall was heavily biased towards British composers (amongst whom Handel, of course, was pre-eminent), and British performers. Most people viewed Italian opera as effete, exclusive and inclined to deprive Englishmen of their natural manliness. Indeed, there was something un-English and even unpatriotic in anything that savoured of the Jacobite movement or of the Catholic church; this included most things Italian and French, especially around the time of the 1745 uprising; so the public image of Vauxhall’s hard-working performers, composers and singers was more wholesome and generally more acceptable than that of their much criticised European counterparts, who were being paid such vast sums at the London theatres. The outstanding musical event at Vauxhall in the first half of the eighteenth century, and probably the best-attended of any event for the thirty-eight years of Tyers’s management, was the rehearsal for Handel’s Music for the Royal Fireworks, on Friday 21 April, 1749 at 11am. It was reported that between eight and twelve thousand visitors flocked to the gardens for this event, causing a memorable three-hour traffic jam on London Bridge. The tradition also maintains that a hundred musicians were engaged for the occasion. There is reason to doubt both these numbers, simply in view of practical considerations, but it is clear that a phenomenal number of people did attend and did pay the 2s. 6d. admission charge. Many news reports confirm this, the most striking of which refers to the 1,025 coaches which passed the turnpike on their way to Vauxhall from the jam at London Bridge. Assuming that each coach carried an average of three people, and that these were only a fraction of those who made the journey, with others coming by water or on foot, it appears that at least six to eight thousand people did attend this one event, an extraordinary record which remained unbroken for many years. Handel himself had not wanted to hold the rehearsal at Vauxhall, possibly because of its limitations of scale, and its location across the river. This rehearsal, six days before the final event in Green Park, was attended by the Duke of Cumberland representing the king. Even if only half of the reported 12,000 visitors actually arrived, this would still have produced £750 income for Tyers (more than one tenth of his annual profits), just for one morning’s entertainment outside his main summer season. By the time of the Fireworks Music rehearsal in 1749, the Rotunda, the first real indoor space at Vauxhall, had been completed. This building, opened for the 1748 season, incorporated an orchestra stage and organ, where the music was played whenever the weather was unsuitable for the more usual outdoor concerts. Tyers believed that the alfresco element of Vauxhall was vital to its success—a belief that was eventually vindicated in the enduring success of Vauxhall for more than fifty years after the rival gardens Ranelagh, which had a larger indoor space, had been demolished. Jonathan Tyers, the son of a Bermondsey tradesman, was a businessman and manager of astonishing skill, creativity and acuity; his pleasure garden at Vauxhall was one of the great success-stories of eighteenth century London, and is the precursor of many of our modern social entertainments. But his outstanding talent lay in knowing his own limitations, and in his ability to select just the right people to work with him to achieve his ambitious objectives. In John Lockman he found the ideal publicist; through William Hogarth, he gained access to the most interesting and original visual artists and designers; and with George Frideric Handel as his adviser and presiding musical genius, he ensured that Vauxhall’s daily concerts were some of the finest to be heard anywhere in Europe. The other direct hint we have of Handel actually working at Vauxhall comes from a written account by an unknown French tourist, now in the Folger Shakespeare Library, Washington DC (M.B.49.1220-1221). This tourist recalls a visit to the Gardens early in the 1738 season, when he saw that ‘M. Hindel celebre compositeur dirige ce concert et fournit les pieces.’ (‘Mr Handel, famous composer, directs this concert and provides the music’ —translation by David Coke, Vauxhall Gardens, A History, Yale, p147 note 32 ). It is possible that this may just have been a rehearsal that the tourist saw, or indeed he may have misunderstood what somebody told him because April was outside the normal opening period of Vauxhall. Despite this and the lack of any financial evidence at all of Handel working at Vauxhall on any consistent basis at this time, we can take it that Handel took a very strong interest in the Vauxhall concerts, and that he probably was, at the very least, advising Tyers (like Hogarth), and maybe mentoring the leader of the band. Even after the opening of the nearby Westminster Bridge in 1750, people normally arrived at Vauxhall by boat as it was an integral part of the evening’s enjoyment. They would listen to glorious and often patriotic music near the bandstands and promenade in the illuminated gardens. The only real description of the music at Vauxhall and its effect on the audience appears in Section 12 of a French periodical, the Mercure de France of November 1750, which published a poem written in French by an English author, probably John Lockman, who was a translator, and always on the look-out for new ways to publicise Vauxhall. This wonderful response to the Vauxhall concert gives us an idea of the balance it achieved and the way it aroused the emotions of its audience. Quels sons! Quells airs mélodieux! Les Concerts des célestes lieux? Sanglots melés de cris perçans! Le touchant & douloureux son. Sous les hetres & les ormeaux. The concerts of the Elysian Fields? My measure follows the bow. The touching and sorrowful sound. An intense emotion is born. Beneath the beech-trees and elms. * This refers to the Dead March, a famous funeral anthem from Mr Handel’s oratorio entitled Saul. This record reflects the second half of an evening’s performance at Vauxhall Pleasure Gardens in a summer season in the late 1740s and includes a selection of instrumental pieces, dance music and songs ending with a theatrical piece—Handel’s masque music to Comus. Three extra songs are added on to the eight which were usually performed in the second half of the concert each night, to showcase the importance of the Vauxhall Garden songs at the time. Songs ranged from the lighter more popular ones with engaging melodies and themes of nature, nationalism, wit, the romantic ballad style, or a melancholic element, to the more complicated and operatically infused coloratura pieces. Jonathan Tyers cleverly looked for new and effective ways to bring Vauxhall Gardens to the attention of the press and had ingeniously converted his own house’s ball-room into a raised pavilion with a private dining room and open loggia for Prince Frederick Louis the Prince of Wales, who was also the landlord of Vauxhall Gardens and became a regular and popular attendee at these Vauxhall concerts bringing with him his youthful energy and a large following of fashionable society. Tyers was keen to make the gardens look more civilised so everyone would enjoy a decorous evening’s entertainment. The song Spring Gardens (Rural Beauty or Vaux-Hal Garden) is written by Dr William Boyce (baptized 1711-1779), a British organist and composer of trio sonatas, concerti grossi, odes and operas as well as songs for the gardens. The text by John Lockman is every bit as diverting as the music itself. His lyrics for Vauxhall songs, set to music by Boyce and Handel, could never be considered great poetry, but were apparently enjoyed by the Vauxhall audiences. Lockman’s songs about Vauxhall and its charms regularly included some reference to the well-loved Prince Frederick Louis and more usually, to his wife Princess Augusta as wherever they went, the public were bound to follow. In Spring Gardens, Princess Augusta is referred to as ‘the Lady of the May’ and ‘ye Queen of May’. This song appears under various titles and is contained in several sources including George Bickham’s Musical Entertainer (1737-1739). Many Vauxhall songs were in circulation before they were performed at the gardens and were reprinted in subsequent collections or song sheets. Many were introduced by Tyers who subscribed to the beautifully illustrated and expensive songbook Musical Entertainer, which shows something of his interest in this kind of music. The diarist and observer of Handel, Charles Burney was a familiar figure at Vauxhall where he played the violin and viola. He attributed the introduction of song at Vauxhall to Jonathan Tyers who engaged several singers including Mrs Cecilia Arne (née Young), tenor Thomas Lowe and the bass Henry Reinhold. Handel’s Concerto No 4 in A minor, Op 6 (HWV 322) is from his Twelve Grand Concertos, (HWV 319-330), first published by subscription in London by John Walsh in 1739 and became Opus 6 in the second edition of 1741. For the 1739–1740 season at the Lincoln’s Inn Fields theatre, Handel composed these concertos to be performed during intervals in masques and oratorios, as a well-advertised feature to attract audiences and showcase himself as both composer and accomplished performer. Following the success of his organ concertos Op 4, Handel’s publisher John Walsh encouraged him to compose this new set of concertos for purchase by subscription under a specially acquired Royal License. There were just over 100 subscribers, including members of the Royal family, friends, patrons, composers, organists and managers of theatres and pleasure-gardens, some of whom bought multiple sets for larger orchestral forces. Jonathan Tyers subscribed to four sets of these 12 Grand Concertos in Seven Parts for Vauxhall Gardens. Earlier in 1715, Walsh had himself very successfully published his own edition of Arcangelo Corelli’s celebrated 12 Concerti Grossi, Op 6. Handel’s concertos had exactly the same choice of Opus number and the same number of concertos as Corelli, which maybe reflect his earlier years in Rome where he was inspired and influenced by Corelli and the Italian school (Handel in Italy, Vol. 1 and Vol. 2). Handel’s concertos had an unprecedented period of five weeks laid aside for their composition in late September and October 1739 which enabled Handel to produce this set of orchestral ‘masterpieces’ for general publication to show off his compositional skills and pay homage to the ever-popular concerti grossi of Corelli. Despite the conventional structure of the Corellian model, Handel’s concertos are largely newly composed and are extremely diverse and in parts experimental, drawing from every possible musical genre and influenced by musical forms from all over Europe. The exquisitely beautiful Larghetto affetuoso of Concerto No 4 reflects a galant style and is followed by an energetic fugue, marked Allegro. The third movement, the Largo e piano in F major is one of Handel’s most sublime and simple slow movements, a sarabande in the Italian trio sonata style. The final Allegro in A minor is a radical reworking of a soprano aria ‘È si vaga’ in preparation for his penultimate opera Imeneo. Although this concerto has a serious quality about it, a typical evening’s concert at Vauxhall contained a mixture of styles of music, juxtaposing popular songs and dances with more solemn, serious music and martial airs reflecting the contrast between Apollo (sophisticated, lyre playing) and Marsyas (rustic pipes), a popular subject of discussion at the time. 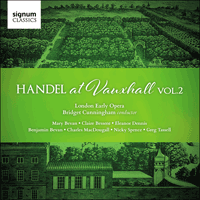 (See The Dead March – Handel at Vauxhall Vol.1). The Power of Music and Beauty is a song by the blind English composer, organist and violinist John Stanley (1712-1786) from the Muses Delight (1754), which is a collection of popular songs containing some simplified versions of the original pieces containing only the melodies and bass lines of the music with no figuring or instrumental lines. Who set the yearly jingle of Vauxhall? Coin English jargon and baptize it Scotch? By the cloy’d public, next month set aside. What should we do for H[ayd]n’s and for H[oo]ks? From 1726 John Stanley was made organist at St Andrew’s Church Holborn, ‘in preference to a great number of candidates’ (Burney), and in 1734 was made organist to the Honourable Society of the Inner Temple where his playing of organ voluntaries attracted an admiring audience including Handel himself. A Song on the Victory Obtain’d over the Rebels, by his Royal Highness the Duke of Cumberland or From scourging rebellion (HWV 228.9) is a patriotic song that Handel wrote in 1746, as well as the Occasional Oratorio, to support the Hanoverian cause. William, Duke of Cumberland, King George II’s younger son, had taken command of the government forces and pursued Bonnie Prince Charlie in Scotland. He defeated the Jacobite army at Culloden and was given a hero’s welcome on his return to London. This rousing song was published in the London Magazine in July 1746 with a note that it had been sung at Vauxhall Gardens by the famous tenor, Thomas Lowe. The words are by John Lockman with the applauding chorus line ‘Your Glasses charge high; tis in brave William’s Praise’. It has an unspecified treble instrumental line which a trumpet or other wind instrument could play and indeed, the famous trumpeter Valentine Snow (c1700-1770) was a regular performer at Vauxhall and he like others, became ‘stars’ in their own right. By 1745 Snow was the most respected trumpeter in the country after succeeding John Shire and became the Sergeant Trumpeter to the King from 1753. This song contains melodic fragments from ‘Volate amori’ in Handel’s opera Ariodante and from his orchestral minuet used in 1749 in the Music for the Royal Fireworks, a movement originally composed for the overture to the Occasional Oratorio. The organ building at Vauxhall Gardens, unveiled in 1735, was constructed in the sub-Palladian manner as a square structure behind the orchestra building, which was linked together by a walkway and formed the most innovative and extraordinary installation by Tyers at Vauxhall. This organ structure contained three levels with the pipes and possibly the main organ console on the first floor while the belfry contained louvred semicircular openings in all four façades projecting the sound to the far distances of the gardens. The great organ itself was possibly built by Richard Bridge with the assistance of John Byfield the Elder and was unveiled in 1737 to a large and fashionable audience. The organ music included an overture ‘that had a delightful Effect in the various parts of the Garden’ (Daily Advertiser). Therefore the organ allowed the band to be heard throughout the gardens and did the job of several musicians which was economically a sound investment for Tyers, allowing the ‘in house’ composers to better showcase their latest compositions. There is a suggestion that some sort of additional organ keyboard remote to the rest of the organ could have been placed alongside the other musicians of the band in the orchestra building, making ensemble playing easier, rather than being at a distance away in the separate organ building, which would have caused insuperable performance difficulties as it seemed likely that the orchestra was directed from the keyboard. An announcement for the opening of the gardens on 30 March 1738, that there had been ‘several considerable Additions and Improvements to the ORGAN’ and circumstantial evidence suggests that there was a ‘long movement’ installed in the adjacent orchestra bandstand between 1739 and 1740, ‘The first long movement made in England is said to have been that attached to this organ in Vauxhall Gardens, by Byfield’ (History of the Organ, 1855, by E.J. Hopkins and Edward Rimbault). A ’long movement’ is a modification of the usual organ mechanism and is ‘a set of trackers enabling an organ to be played at a distance from the instrument itself’ (For further information, read BIOS Journal 39 2015 by Peter Holman). An engraving of the Vauxhall bandstand, published in 1751, shows a man sitting at a harpsichord in the middle of the orchestra which again would have helped solve these issues of ensemble playing. Handel’s Hornpipe in D major (HWV 356) was ‘Compos’d for the Concert at Vauxhall 1740’ and was considered one of the archetypal English forms of dance music associated with England, not only the sea. Although general dancing at Vauxhall may have been informal and spontaneous, these lines may refer to a particular dance as the Prince of Wales’s party danced more formally in his private pavilion. Handel’s serenata or masque, Comus or There in the Blissful Shades (HWV 44) is a theatre piece in an unknown hand from a collection of his works put together by his librettist Charles Jennens. The words are adapted from the epilogue of John Milton’s Maske, in which the attendant spirit relishes the idylls of the heavenly realm to which he is to return. This Maske was presented at Ludlow Castle (1634) and was later adapted by John Dalton in the early eighteenth century to become known as Comus, set to music by Thomas Arne. In 1745, and at the age of 60, Handel was invited to spend his summer recuperating from poor health at the country seat of the Earl of Gainsborough at Exton in Rutland. This invitation may have come through Lady Gainsborough, a sister of the Earl of Shaftesbury, one of Handel’s keenest supporters. For the pleasure of other guests, the family decided to put on an open air performance of Arne’s Comus and invited Handel to write a new musical epilogue of three songs with a chorus at the end of each. The original performers of Handel’s freshly composed Comus were presumably Gainsborough singing bass and his daughters singing the soprano arias. Not long after this, Handel reused much of this music for his Occasional Oratorio. The Arcadian idylls described in John Milton’s works inspired Tyers’s vision for Vauxhall Gardens with arched walks, sweet music, revelry and feast. The group chorus singing in Handel’s Comus, ‘Happy, happy, happy plains’, may well have ended an evening’s concert at Vauxhall Gardens. At the gardens in the late 1740s, there were three very elaborately designed and decorated Piazza buildings of supper boxes, the northern one initially called the Temple of Comus (later the Chinese Pavilion), the southern one generally referred to now as the Handel Piazza and the smaller structure in the western range called the Gothic Piazza. The Temple of Comus, first erected in 1748, was named after Comus, the God of revelry and good food who is associated with music and with floral decorations in Ben Johnson’s masque Pleasure Reconciled to Virtue. This links in with the main aim of the supper boxes—to be used as dining rooms and also for the appreciation of arts, inspired by the artist William Hogarth and the vision of the poet John Milton, as well as music and polite conversation in civilized surroundings. The Handel Piazza on the Grand South walk started out in 1747 as a small semicircular colonnade of plain boxes in an open air setting around Roubiliac’s statue of Handel. It was rebuilt in 1750 but still remained more classical and restrained than the elaborate and refurbished ‘Chinese style’ of the Temple of Comus. The contrasting styles of the two temples, the Chinese pavilion and the Handel Piazza epitomizes Tyers’s ideological belief in the balance between excess and moderation. Comus represents pleasure and excess and Handel in a more simple classical setting, reflects a more civilised sobriety. There was also a statue of John Milton, probably by Roubiliac working with Henry Cheere, at the northern end of the Cross walk at Vauxhall Gardens apparently displaying Milton as Il Penseroso, seated on a rock, eyes gazing upwards and ‘in an Attitude listening to soft Music’ (John Lockman’s Sketch), his ability to listen perhaps instilled in him by his father who was a composer. Facing Milton from the other end of the walk was a statue of Apollo, the patron of music and poetry and sun god showing the balance of understated virtue with brighter sensual pleasure. This statue of Milton was intended to complement the statue of Handel—the latter considered the greatest composer of English music, and the former, John Milton, one of the greatest figures of English literature. Whilst in the verdant spot we stray or The Ladies in Vaux- hall- Gardens, to the British Officers at Dettingen was composed by Thomas Gladwin with words by John Lockman and again praises the wonderful gardens ‘Where Music lulls the listening ear, Where nightly splendours vie with day, and all sweet magic does appear’. Whilst your fam’d Victory fills our Mind. Win Myrtle, next, in CUPID’s Field. Roger and Sue a Ballad to a Favourite Air by Sig.r Hasse is a comic song contained in the collection Calliope or English Harmony by the eighteenth-century German composer, singer and teacher of music, Johann Adolph Hasse (baptised 25 March 1699-16 December 1783). Although Hasse composed a considerable amount of sacred music, he was best known for his prolific operatic output. For several decades he was the most widely admired composer of opera seria in Italy and the German-speaking lands. His finest operas include a highly systematized, rational style which were well produced and performed at leading theatres. He was married to one of Handel’s leading Italian singers, mezzo-soprano Faustina Bordoni and was a great friend and favourite composer of the librettist Pietro Metastasio, whose libretti he frequently set. Although the author of the words for the ballad Roger and Sue is unknown, it is based on Gandarte’s aria ‘Apenna amor sen nasce’ in Hasse’s opera Cleofide (1731) with original text by Michelangelo Boccardi after Metastasio’s Alessandro nell’ Indie. Apart from the in-house composers such as Arne, Gladwin and John Worgan, the only composer other than Handel to be named at Vauxhall Gardens up to 1745 is Johann Adolph Hasse. Although Hasse never visited London, a group of his ‘celebrated concertos’ in eight parts was advertised as being performed at Vauxhall. The inclusion of his music at Vauxhall (via Tyers’s books) must, in part at least, have been due to Handel who used Hasse’s arias in several of his London pasticcios. A Loyal Song for two Voices or God save great George Ye King is an early setting of the British national anthem ‘God Save the King/Queen’ from the Muse’s Delight. It is uncertain who actually wrote this music, although its origins have been atrributed to a keyboard piece by John Bull, music by Henry Purcell as well as to a Scots carol, Remember O Thou Man. The first published version of the present tune appeared in 1744’s Thesaurus Musicus, featuring the familiar first verse. It appeared in the Gentleman’s Magazine in 1745 when it first found popularity, although it was not called a ’national anthem’ or used as such until the nineneenth Century and has never been officially adopted as an anthem by either the Royal Family or Parliament. In 1745, following the victory by Bonnie Prince Charlie and the Jacobites over King George II’s army at the Battle of Prestonpans, a wave of patriotic feeling swept across a Hanoverian and Protestant London. Despite being a Catholic, Thomas Arne, who had previously written Rule Brittania, set a new, extended version of ‘God save great George Ye King’ which was played after evening performances at Drury Lane. Perhaps this put him, with his Catholic faith, in a safer position in London, as certainly English patriotic spirit and Protestant feelings were growing and continued until after the Battle of Culloden and the defeat of the Catholic Jacobites the following year. Various settings of this text appeared and were performed with other loyal songs at Vauxhall Gardens along with Handel’s own ‘God Save the King’ from his coronation anthem Zadok the Priest. English music may with justness be called Handel’s music and every musician, the son of Handel; ... He has join’d the fullness and majesty of the German music, the delicacy and elegance of the Italian, to the solidity of the English; constituting in the end a magnificence of stile superior to any other nation.